"The King of Dieselbilly" has returned from a five-year hiatus, delivering an eclectic mix of country-roots cuts that is as good a reason as any to kick up your heels and party. When Elvis Costello stepped out to face the crowd at last year's annual Hardly Strictly Bluegrass Festival in San Francisco's Golden Gate Park, the singer was backed by an ad-hoc band of Bay Area musicians he dubbed Hammer of the Honky-Tonk Gods. 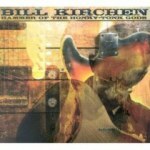 The name was in honour of country-roots guitarist Bill Kirchen's first studio album in five years. During the set, Kirchen joined Costello onstage to perform a rendition of the title track, a pumped-up rockabilly paean to the Fender Telecaster, which he admiringly sings was, "Born at the junction of form and function". Kirchen (also known as "A Titan of the Telecaster", or even better, "The King of Dieselbilly") is well-respected as a guitarist and singer by his peers, received a Grammy nomination in 2001 for his instrumental song, "Poultry in Motion". Additionally, he was inducted into the Washington Area Music Association Hall of Fame alongside Dave Grohl, yet the virtuoso guitarist is still usually remembered by audiences for his work with the '70s renegade country-rock band, Commander Cody and his Lost Planet Airmen. If you have ever heard the high-octane cover of Tex Ritter's "Hot Rod Lincoln", you'll be familiar with the resonant twang of Kirchen's trademark big-rig guitar. But life moves on, and so has Kirchen. After the original Lost Planet Airmen split in 1975, the country rebel continued to mine the same musical vein, blending a contemporary take on honky-tonk, boogie-woogie, rockabilly and especially, Western swing with his new band, the Moonlighters. He then went solo and recorded a string of albums, including the excellent, Have Love Will Travel, in 1996, and his ode to truckin', 2001's Tied to the Wheel. Hammer of the Honky-Tonk Gods finds Kirchen tooling down the same musical highway as before, providing a fine example of that old adage, "If it ain't broke, don't fix it". On the very first listen, you know this is a comfortable trip to take with Kirchen recording an eclectic mix of 11 cuts that just sound like a bunch of friends getting together in Proper Records' London studio to whoop it up. And when ex-Moonlighter Austin DeLone shares keyboard duties with Geraint Watkins, and the rhythm section consists of Robert Trehern playing drums alongside Nick Lowe on bass (all three of these guys are former bandmates of Kirchen's from Lowe's 1994 comeback album, The Impossible Bird), that's pretty much what you get. What is unusual, however, for an album by this six-string picker, is the strength of the handful of self-penned tunes between the requisite covers. When the dust has settled, and the raucous guitar-twang of the title track fades, Kirchen slips straight into "Rocks Into Sand", a mellow country ballad that's buoyed along by a Luther Perkins-style boom-chugga-boom guitar riff as his voice takes on shades of Lee Hazlewood and Mark Knopfler. "Get A Little Goner" next lifts the record back into party mode, with Kirchen's vintage Telecaster trading licks with some shimmering steel guitar, even though the song is a heartbreaker. Elsewhere, this pioneer of Americana slips in an original piece of fiddle-drivin', toe-tappin' Western swing called "One More Day", while the excellent "Working Man" marries street corner doo-wop backing vocals with echoes of Duane Eddy-guitar work for some hybrid '50s R&B. But what really makes Hammer of the Honky-Tonk Gods such a pleasurable experience is Kirchen's choice of material by other songwriters placed alongside his own cuts. Where else would you hear such a rarefied mix of numbers that brings together a dash of Jerry Lee Lewis-style piano-boogie ("Heart of Gold), with the barroom-piano-blues of Blackie Farrell's "Skid Row in My Mind", a close-to-the-bone version of Shorty Long's 1964, R&B Motown classic, "Devil With A Blue Dress". The melodic melancholia of country-soul pioneer Arthur Alexander's "If It's Really Got To Be This Way", sadly, brings this party to its salubrious close.